I have noticed over the past couple of months the importance of routine in Scarlett's life. There are certain things that we do EVERY day with her. I try to cling to those things knowing they I can't be with her all day every day. So our mornings and nights are where I fit in all of my mommy time. Sometimes these are the only times in our days when I am around to teach, discipline and love, so I make sure they count. And to make the counting easier, we started routines. A couple of weeks ago we took off Scarlett's shirt at the dinner table, so she could make a total mess of herself and I wouldn't have to be a mother hen worrying about stains on her clothes. The first thing she said was "bah time" (bath time). She repeated it over and over until she was done eating, shook her hands in the air and said "ah don" (all done). We let her out of her chair and she ran to the tub. Something triggered in her brain, shirt off, dirty, bath. Although Scarlett loves the bath anytime, she knows when in the day we do bath time and what steps are usually taken to get there. 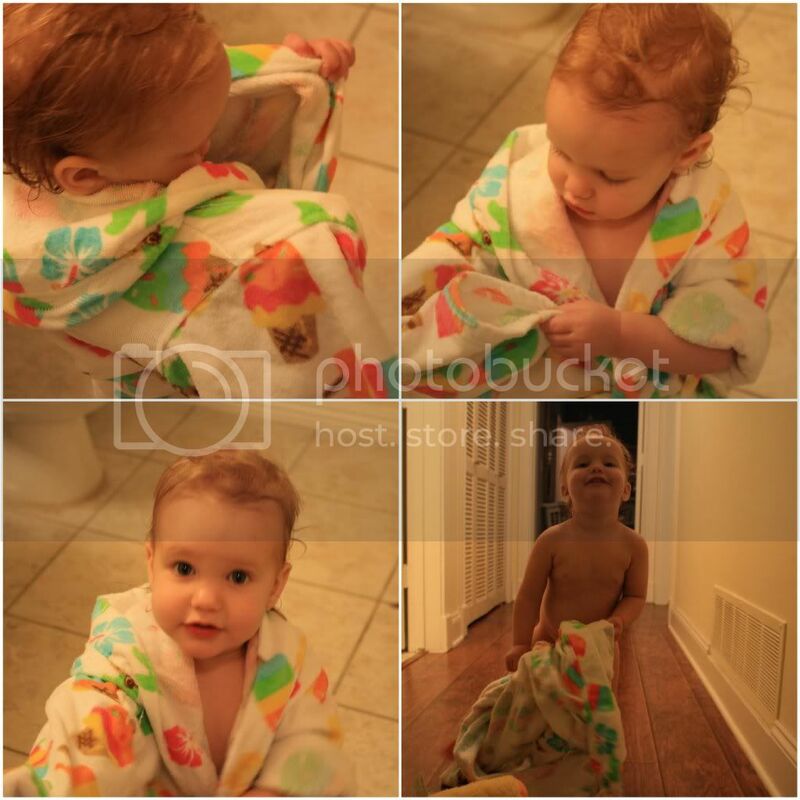 Getting dirty, step one, getting undressed, step two, running to the tub and screaming "bah time", step three. After the bath comes the robe...oh the robe. She loves it, then hates it. Puts it on with a smile then rips it off while running down the hall. Then comes PJ time, this is when it all falls apart. We remind her every night that this is the routine, this is just what we have to do before bed. As much as she tries to wiggle and squirm her dad and I always win. She calms down the moment her onsie is zipped to her chin, climbs to the couch and is ready for a bedtime story. She turns the pages, makes the correct animal sounds, closes the book and puts her hands together for prayers. Two seconds into prayers she is ready for bed. She cries for her "ba-ba", interrupting the Lords Prayer. Chris prays for our family and those we know in need, gives Scarlett a kiss, closes the door and turns out the light. We are alone in the dark, finally quite. I cherish these moments knowing that they will not last much longer. Scarlett's damp hair sinks through my shirt as her breathing slows and her bottle empties. I lay her down, she cuddles her stuffed animal of choice, I lay a blanket over her tired body, lean over, kiss her little cheek and whisper "I love you". I will never give up this routine. She will always, always know that I love her and I will always, always kiss her goodnight as she drifts away into her dreams. It's so sweet that she thought of bath time!